The Japanese Barberry is in a class of deciduous shrubs with thorns that can tolerate a little punishment from the environment or poor soil. 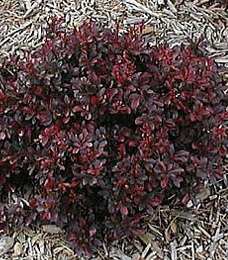 Dwarf Barbery has a deep crimson colored foliage all season and the new growth is bright red in color but this plant does best in full sun to produce its color. Beadlike, bright, red berries stud branches in the fall through winter.